These are just some of the phrases that will be fizzing around your head as you leave Dynamo’s ‘Seeing Is Believing’ Live Tour, currently conjuring up a storm at the Edinburgh Playhouse until Saturday 28th November. Thanks largely to his TV show Magician Impossible, Dynamo (real name Steven Frayne) is now an internationally recognised magic personality thanks to mind-boggling tricks… which he performs live as part of his tour! I won’t reveal any of the illusions (they really must be seen to be believed!) suffice to say, the guy in the seat next to me was chosen to partake in an astonishing game of chance that quashed all cynical thoughts of ‘plants’ in the audience. These were real people, real answers… and real magic! Presenting itself as quite a personal show, this live production is stacked with moving references to the magician’s background, family and influences. Dynamo delivers his material in an awkward, yet very endearing, manner - his sincere and well-meaning nature serving to remind the 3000-strong audience that this is ‘Dynamo of Delph Hill’ realising his dream and inviting us to step into his childhood imagination with him. It’s this version of Dynamo that proves to be the real treat of the evening. Inspiring the next generation of young people to rise up against their own fears and have the courage to embrace magic in all its forms – whether it be a card trick, some sleight of hand or a simple human interaction – Dynamo seemingly wants to use his talents to break down barriers. 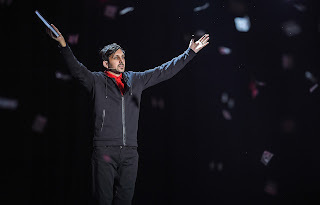 And as the audience vanishes into the night air, you’re left with the distinct feeling that you’ve all personally connected with Dynamo – a fantastic trait which cannot be said for his peers - and experienced a truly unforgettable, uplifting evening of entertainment. 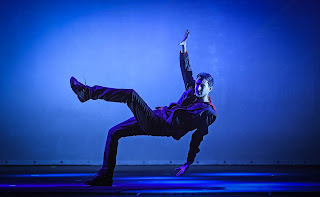 Dynamo: Seeing Is Believing is at the Edinburgh Playhouse until Sunday 29th November (including Saturday matinee). Tickets are available at www.atgtickets.com/venues/edinburgh-playhouse or by phoning the Box Office on 0844 871 3014.